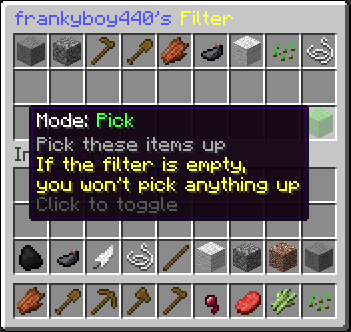 Save after restart - Save player's filter to a file and load them back after a restart. If you have an issue with this plugin please write it on the discussions page for the plugin and don't leave a bad review just because you can't find the discussion page. Leave suggestions and feedback in the discussions page as well. You are not permitted to decompile or modify this plugin in any form. You take full responsibility of any issues that may happen on your server due to this plugin, the plugin has been tested extensively and should not contain any bugs, but I cannot guarantee this 100%. DeadMaster and Xodetaetl like this. It's one of my favourite mods. 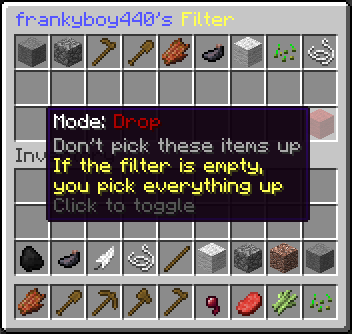 It's very useful also very helpful for mp servers (generally if you have a xp farm :p) Before item filter, we had to drop all items everytime, so it helps me so much. Thanks for author. But please look to discussion page, I have little problem. Nice, very good plugin to manage server !! 5 Stars ! !, continue in this, it is really awesome bro!